Louis Vallin was a competent and long-serving French cavalry officer whose career spanned the French Revolution, Napoleon’s Empire, the Bourbon Restoration and the government of Louis-Philippe. Unlike many of his compatriots, he managed to distinguish himself under all of his various political masters. 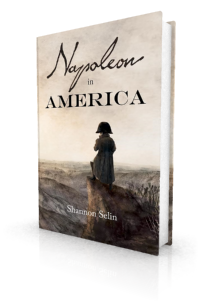 In 1823, Louis Vallin confronted Charles Fabvier’s band of insurrectionists at the Bidassoa River, both in real life and in Napoleon in America. In 1807, Vallin became the colonel of a regiment of hussars. Vallin fought at the Battle of Piave River in May 1809. Marshal Jacques Macdonald mentions Vallin in his recollections of the campaign. Vallin had answered that he would have done so already, had I not forbidden him to stir. A couple of months later, Vallin fought with distinction in the Battle of Wagram. He was subsequently named a baron of the Empire. On July 12, 1810 in Paris, Vallin married Saubade Garat (1769-1821), the daughter of Baron Martin Garat, director general of the Bank of France. They had three children, Angélique (born in 1812), Léonie (1815) and Marie Louise (1819). Vallin distinguished himself in the Russian campaign of 1812. He was promoted to general of brigade and placed in command of the vanguard of troops led by Eugène de Beauharnais. In 1813, Vallin was named second in command of a regiment of the Guards of Honour. For more about the Guards of Honour, see my post about Louis Lauret. After Napoleon’s 1814 abdication, Vallin commanded a cavalry brigade in the army of King Louis XVIII. When Napoleon escaped from Elba in 1815, Vallin joined the Emperor’s Belgian campaign. He took over command of the 7th Cavalry Division when General Maurin was wounded at the Battle of Ligny. In this capacity, Vallin was with General Grouchy’s forces at the Battle of Wavre. Prior to the battle, Grouchy’s subordinate General Gérard suggested to Grouchy that they should instead march in the direction of the sound of distant cannon fire. Grouchy insisted on following the Prussian forces he was chasing. The battle in which Vallin might have assisted was the Battle of Waterloo. After the French defeat, Vallin’s cavalry flanked the army in its retreat towards Paris, pursued by the Prussians. The French provisional government promoted Vallin to lieutenant general. On July 1, 1815, on the plain of Montrouge outside Paris, Vallin made one last attempt to defend the city. After entering Madrid, the Duke of Angoulême sent a detachment under Vallin in pursuit of the Spanish corps that had formed the garrison there. Vallin caught up with the Spanish corps outside Talavera and defeated them. The Spanish campaign resulted in Vallin becoming a grand officer of the Legion of Honour. Louis Vallin continued to serve off and on as an inspector general of cavalry until 1828. After a period of inactivity, he served as an inspector general of gendarmerie in 1834-35. In 1839 he was placed on reserve. In 1848 he officially retired. General Louis Vallin died on December 25, 1854 in Paris, at the age of 84. His name is inscribed on the Arc de Triomphe in Paris. This and other biographical information about Louis Vallin comes from Louis-Gabriel Michaud, Biographie Universelle Ancienne et Moderne, Nouvelle Édition, Vol. 42 (Paris, 1865), pp. 506-507. Camille Rousset, ed., Recollections of Marshal Macdonald, Duke of Tarentum, translated by Stephen Louis Simeon (New York, 1893), pp. 144-145. Henry Houssaye, 1815 Waterloo, translated by S.R. Willis (Kansas City, Mo., 1905), pp. 156-157. Alphonse de Lamartine, The History of the Restoration of Monarchy in France, Vol. 4 (London: 1854), p. 132. Would like to know if what i just read is factual in part or actual in full. The article is all based on what I could find about General Vallin in the historical record, Sandra. 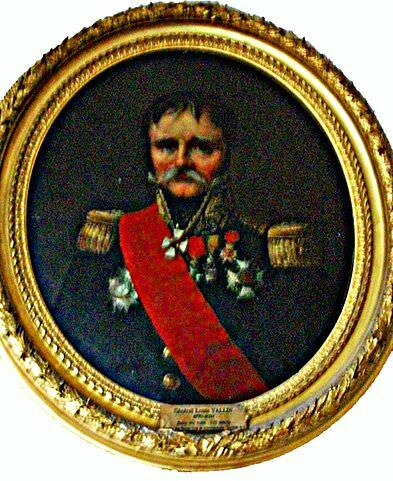 General Vallin galloped up to a piece of artillery in battery on the French abutment of the broken bridge, and, without parleying an instant with the refugees, ordered them to be immediately fired upon.